It's been some time... really some time since I last update. Look at the chat box... see how many people flaming me. Recently been really hooked up at an old game, couldn't stop playing it. Even some of the reviewers said that this game can easily accumulate up to 500 hours of playing time. I'm almost there, now being close to 200 hours playing time. What game is this you might ask? 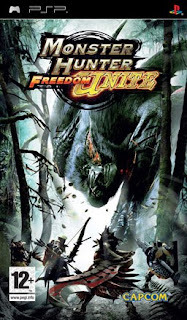 It's Monster Hunter Freedom Unite (MHFU) for PSP. Besides doing solo quest, this game encourages the spirit of hunterhood. You may play this game with 3 other hunter friends. Totaling up to 4 players cooperating taking on some quests. And there's even something like Garena to make the game fun playing called XLink Kai (Kai). Been playing on Kai from morning till late night, but until recently. Not sure what happened but Kai could no longer detect my PSP. Been trying to figure out what had happened but to no avail. Hopefully someone out there could help me. OK... back to real life, it's been some time since I last played futsal too. If any of you wanted a noob player to play with, do not hesitate to gimme a call. I'd be happy to join you guys for futsal or field football. Nevertheless, my holiday is quite nice. My girl is back in town. Planning stuffs and things with her. Hehehehee... preparing for my steamboat buffet this Thursday night also and then another Broga Hill hike on Friday. This is gonna be super fun... although exhausting I must say.